Mexican Hat (also known as upright prairie coneflower, long-headed coneflower, and several other names) is an interesting native perennial that has unique blooms. The flower has somewhat resemble sombreros (hence the common name!). Mexican Hat (Ratibida columnifera) is part of the prairie coneflower group, and in the aster family. This native plant thrives in full sun and well drained soil. I grow mine in rocky clay, and they love it! They don’t get too big, as mine never exceed 2’ and bloom in late May or Early June, and bloom well into July. These flowers are loved by bees. They produce tons of blooms providing a valuable nectar source. This plant produces a taproot, and is thus quite drought tolerant. Allegedly, the origin of the common name “Mexican Hat’ comes from the slight resemblance this flower has to a traditional Sombrero. I can see why someone would come up with this name, particularly for the variety that is more yellow. The petal colors can range from mostly yellow to all red. The plants I’ve grown have always been full of blooms, and keep their foliage all summer into fall. Ratibida columnifera has a well earned reputation for being a tough, hardy perennial. Mexican Hat can naturalize an area, so could be useful for helping stabilizing banks, etc. It does tolerate competition, and can make a good border. But will naturalize easily. I’ll give you updates to mine, as I had 5 mature plants last year. This is an easy plant to grow from seed. Winter sow them in February or early enough to give them 30 days of cold moist stratification. Then, just plant them on the surface, or barely covered by 1/8″ soil (3 mm). I’ve always had a very high germination rate from these plants. So, you won’t need many seeds. I start them in six-cell pots that are 3″ deep, then transplant into 4” pots after a few weeks. Then, transplant into the garden when they are about 4” tall. Sun sun sun! These plants love the sun and can be a great addition if you have a drier area. They don’t require much watering, but as always – if you see the edges of leaves turning brown and crispy, then give them a drink. They may need division after several years, but overall they are full, easy to grow plants. Just try to make sure they are in well drained soil, as this plant can succumb to root rot. I’ve had them flop over after a while, as the stems can get a bit top heavy. But, I’ve found this to be something that happens to individual stems. Overall, this is a very easy plant to grow, and gives long blooms. Mexican Hat is a good ornamental wildflower, but you need to have more than one. A single specimen won’t ‘pop’ with color as much as a small cluster. I personally have 5 (as of now) grouped, and use them as a border between some taller flowers and smaller plants (winecups). They can also be used to reestablish or naturalize an area, with the large amount of seed they produce and the ease of germination. Does Mexican Hat make a good cut flower? Absolutely. This flower has produced so many blooms for me that it always finds it way into bouquets. The blooms tend to last quite a long time in a vase. And the best part – when it is time to compost the flowers, you can be assured that the plants have produced tons of new blooms for a new bouquet! Native Americans used this plant in a variety of ways. A tea would be made form the leaves and flower heads and used for treating various ailments like cough, fever, nausea. But, I would suggest you go to a pharmacy to treat any ailments you have, as I’m not aware of any truly ‘accepted’ medicinal properties of this plant. Additionally, Native Americans could also produce a yellow or red dye from the boiled flower petals. You can get 100+ seeds from a single seed head. Very easy to harvest! 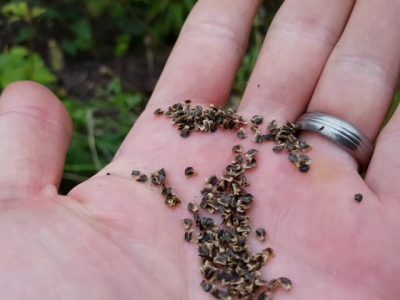 Harvesting Mexican Hat Coneflower seed (Link is to a video) is one of the easiest – maybe even an easier seed to harvest than Blue Vervain! Several weeks after the blooms have dried, clip off several seed heads. Then just roll them in your fingers and voila! You have several hundred chaff-free seeds! Store them in a cool dry place, in envelopes or bags until next year when you are ready to plant. Please have a look at our detailed guide to saving/storing your own flower seeds. There are a lot of great tips in there. Bees love this plant. It is the main visitor I see when I go to admire them in our wildflower garden. As far as pests go, I don’t think I’ve ever noticed rabbit damage on any of my Mexican Hat Coneflowers. This is significant, as I have them very close to other plants that the rabbits love, such as Winecups and Echinacea Purpurea. Fauna Associations Bees frequent this flower. Also the following caterpillars; Sunflower Moth, Blackberry Looper Moth, Wavy-Lined Emerald – and a few more not listed. Native Range The original native range is from the Eastern Rocky Mountains in Canada, to the great lakes – then South to Texas-Arizona. Although it has been established in just about the whole continental USA except for Oregon/Washington. LOOKING TO PUT IN A NEW GARDEN BED? Be sure to read these 1st! !